By Ben Azari, Pulsar LED Time & Army Radio Sales Co.
A long time ago when the original Star Trek and Kojak TV shows were running and people were going to the moon, I was not even a teenager. I was walking back home one day from school, I saw for the first time a fantastic new watch, the likes of which I had never seen before. 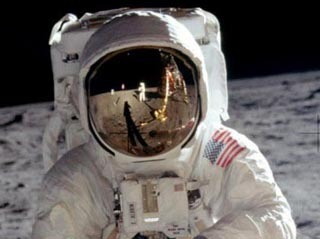 It had a gold metal case and strap and a mysterious dark window which reminded me of an Astronauts visor that we were frequently seeing on TV back then. The thing looked like something from outer space! Picking up courage, I walked in to the jewellers shop and asked the man about this mysterious watch in the window. Can I have a look at that strange watch in the window please, is that a watch, I asked! He took a long look at me. Probably thinking to himself, here we go another time waster! He handed me one from under the counter saying be careful don’t drop it, they have just come out, it has a LED. Huh what? The moment I had it in my hand I knew I wanted it. It was big. And it was heavy. He said go on press the button on the side. The dark window lit up showing actual numbers in bright red light, wow is that the time? I asked, yes he said and if you hold the button you will see the seconds. This was the most impressive thing I had ever seen. So cool, wow a digital watch! I could see the time as red coloured numbers which change in real time in front of my eyes as the seconds tick away, like a dance of numbers I can watch all day and even at night! By now I wanted it more than anything else in the whole world and wondered how it worked. I asked the Jeweller the price, he said, son, this costs more than you will ever be able to afford and told me the price. He said he had cheaper models of the same type watch with red display made by Pulsar and Hamilton, but I wanted the one in my hand, this was the watch for me. The difference between the watch brands was unknown to me at the time. Apparently I had good taste even at that young age and had picked one of the more expensive brands on the market. At least it wasn't solid gold! 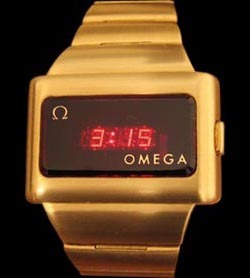 "Telling Time Will Never Be The Same Again"
I wrote down the details, Gold Skin Omega TC1 LED Time Computer watch and ran home to tell my dad. My dad was still at work and I couldn’t wait for him to come home so I picked up the phone and called him, dad, dad, dad, I saw this fantastic new watch today, you have never seen anything like it. There is a button at the side and when you press it the time is shown in numbers and the numbers are red light and you can see it though a dark window, you see the numbers change….. He said he is busy and will speak about it when he gets home later. I was really disappointed when he came home later that day and tried to explain to me why we could not afford it. Despite working for an oil company he said he will have to work for a whole year and save all the money to buy the watch. I didn’t think that was a problem but he thought it was! 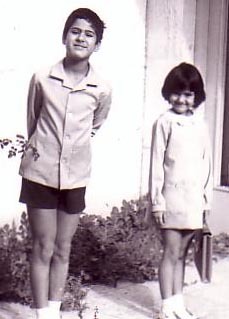 I offered to do work around the house, wash the car every day and be good at school and not to fight with my sister, but he said no and that was the end of that! Soon these Light Emitting Diode LED watches disappeared from the shops and were replaced with cheaper Liquid Crystal LCD Display watches from Japan. My dad eventually got me a Casio LCD watch and I was happy with that, at least it was digital. 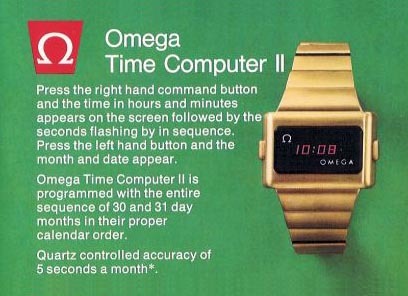 Probably seeing that Omega watch back then was the contributing factor setting me off in my future life in electronics. 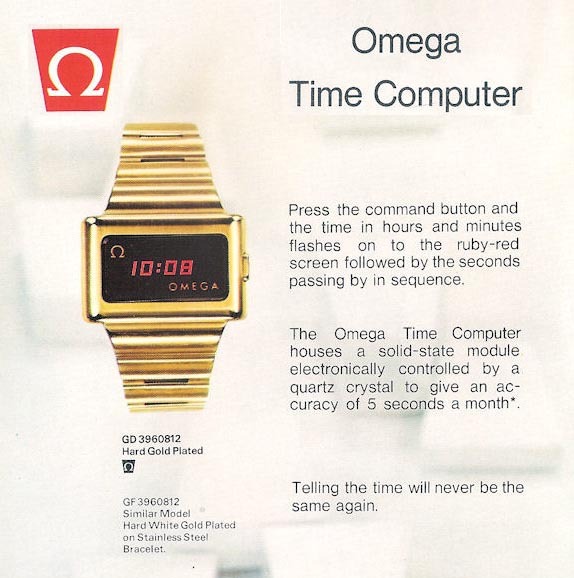 Years passed, with my hair now going grey and heavy in to electronics, engineering, computers and software design, that Omega Time Computer watch was just a distant memory from my childhood. 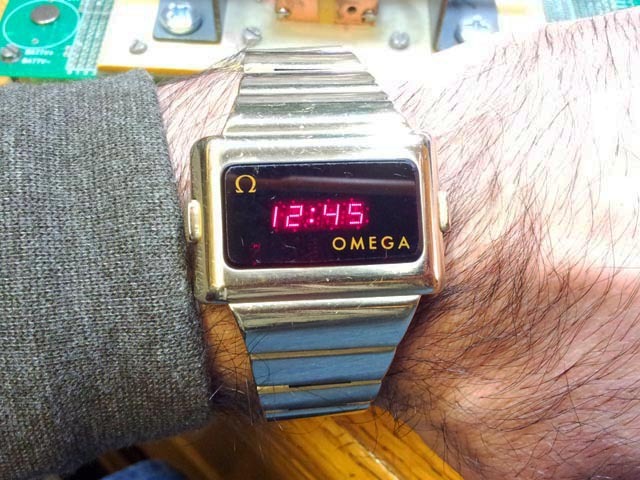 It was eight years ago while sitting in the office pretending to be working, but really surfing the internet killing time like one does, I came across the exact type of Omega watch I had seen some 40 years earlier in that shop window. I had to have it, this time price not a problem. It was being sold as un-tested the seller said he could not open the back to try batteries, really! Being in to electronics and having all the tools and instruments necessary to work with small SMD devices I did not think that was a problem and I bought the watch anyway. I had to try it out and get it going. Got the back off the watch and what I saw was a complete mess! The original but now obsolete large 355 batteries were still installed in the watch and after so many years they had leaked badly corroding the module and circuit board. I cleaned and repaired the damaged tracks on the circuit board and sort of got the module half running. The black paint covering the entire module and circuit board is awful, when mixed with the battery acid it gets sticky and it’s hard to clean. One of the problems was the oscillator circuit which was not oscillating. 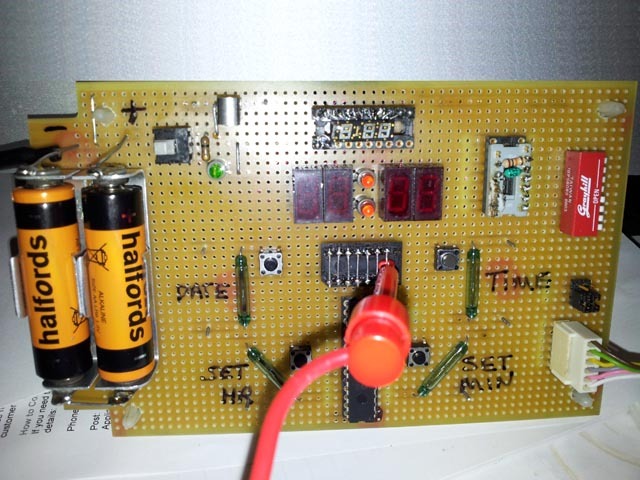 Feeding the module with an external 32.768 KHz clock signal got the module temporarily running. The other problem was that not all the segments of the display were lighting up. 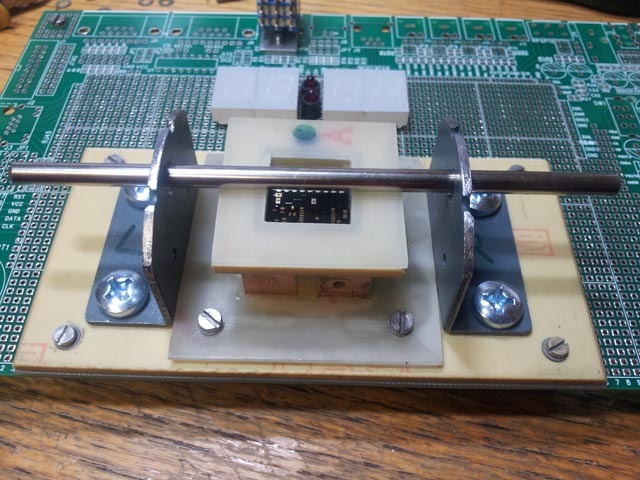 One of the missing segments was traced to a bad driver transistor, which was fixable but the other dead segments were traced back to the chip it self, not good! 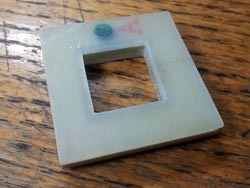 Removal of the chip revealed more corrosion underneath. Viewed under a microscope, one of the bonding wires going the leg of the chip looked eaten away. There was no way I could fix this. Damn! There was hardly any info on these watches on the internet back then. I was more than determined to get the watch working. Then I found out that the same exact modules are used in other watches made by Pulsar and Hamilton. Omega did not make the modules them self’s but bought them in from Pulsar and installed them in to their own case. Spare parts and modules for these watches have long been obsolete and none are available. The only way to get parts is to remove parts from other scrap modules. So I bought a few more non working watches of Pulsar and Hamilton types having various faults and reversed engineered them to learn all I could. These old Pulsar dot pattern LED displays or as some people wrongly call them dot matrix LED watches were a marvel of modern technology back then and I liked the way they were constructed. I got pretty good fixing them and started fixing them for other people. But unfortunately too often the watch module was beyond repair and to the owner’s disappointment I had to return them un-repaired. This got me thinking that it was very rare for one of these pulsar LED modules to have a faulty LED display or bad magnetic reed switches, it’s usually the rest of the circuit that has a problem, something like a bad chip or corroded circuit board would normally write off the watch as un-repairable, which was a shame. Spare parts are no longer available and I don’t think that even back then you could go and just buy the chip off the self. I am sure Pulsar would sell you a brand new module instead, but sadly even these are no longer available. The only logical way out of this situation was to build a replacement module from scratch using modern components to function exactly like the original Pulsar LED watch module. Then with this new replacement module I will be able to remove the original Pulsar LED display from the faulty module and re-use it along with the original plastic carrier and micro reed switches on the new module. The end results would be a working watch using the original dot pattern LED display. 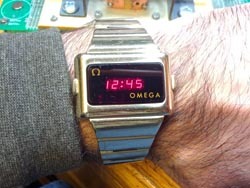 It would look and work like the original Pulsar watch. Now here is a dilemma, I like to keep things 100% original and a watch which is all original and working is obviously a better bet, but given the choice between a dead un-repairable watch which is 100% original to a working watch which is 80% original I will leave you to decide. I decided to go ahead with the project and make a prototype, sort of proof of concept. Code name for the project was PLT-1, which stands for “Pulsar LED Time“ and the 1 because it’s the first module of hopefully many! Work progressed slowly, I was far too busy at work, and then our first child was born which took up what ever free time I had left. At this point a friend came on board and offered to help out with some of the core software which was to run on the modules. It was decided from the onset of the project that this module should not only be as good as the original Pulsar module, but be better than original! It should be able to do more things than the original ever could, after all almost 40 years have passed and technology has moved on. The final look of the circuit board was un-important to me. I was not going to copy the thing for its looks. The new module is never going to be the original module, so why restrict your self by using components that try to mimic the original look instead of the best components for the job. The new module also had to be two modules in one. It should work exactly like the original module out of the box and function like a single button time only watch or a dual button time and date watch. 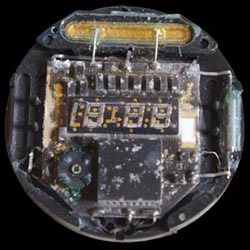 The new PLT-1 replacement Pulsar LED watch module replaces the modules in the following watches. Pulsar P3, Module #3013 Dual Button Time and Date LED Watch. Hamilton QED Module #995 Single Button, Time Only LED Watch. Originally I intended to have factory settable links to set the mode, but later it was decided to put the owner of the watch in charge and have the mode selecting done through the configuration menu. It was also decided to include two additional user settable modes to enhance the functionality of the original watch beyond what Pulsar ever intended to! Other features that we came up with were the user settable display time out timer, user settable display brightness level adjustment, a low battery warning system and display segment test. Another area of the original module which could do with improvements was with accuracy. So for our new module we choose one of the best high precision flexural tuning fork Quarts Crystal available. 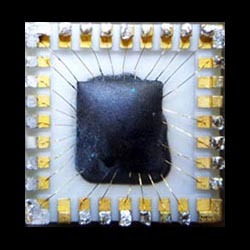 The Crystal is hermetically sealed in a ceramic package and has a accuracy of +/- ten parts per million. The crystal oscillator is then trimmed and calibrated via software. This should be much more accurate than the original Pulsar module. 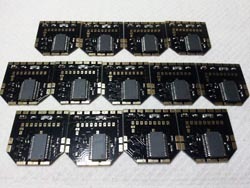 We also decided to make the gold plated circuit board of the new modules from a highly durable glass fibre material and chose black for its colour. 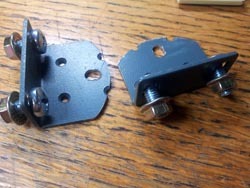 The original modules were covered in black paint. I do not like it. It’s unprofessional and looks awful. The reason for the black paint was that the original module used a Ceramic PCB that was white in colour and incidentally sometimes prone to cracking. Most of the components mounted on that board were also white in colour and it all showed through the dark window of the watch. Pulsars solution was to cover everything with black paint! 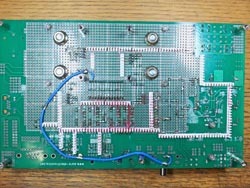 Instead we choose a black coloured circuit board to minimize the problem and make the new circuit boards nice and tidy. 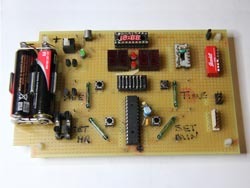 Eventually after a few slow years and a few revisions and software updates later we had a good stable working prototype. With the hardware now fixed I could concentrate on miniaturisation, circuit board design and software development of the new PLT-1 module. With the core software which was written by my good friend Gerry Sweeney "His Website Here" now running on the crude prototype board, we were able to get the basic functions of a watch running. 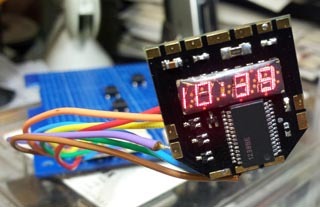 There was still a long way to go in regards with the software, but I was happy that making a new replacement Pulsar LED watch module was possible. 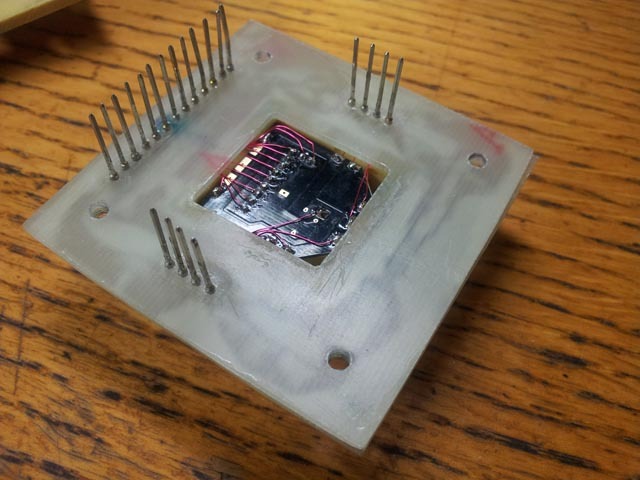 I built the first prototype using large components that I could see and handle easily. Next step was miniaturisation to fit all the components on to a circuit board with the same dimensions as the original Pulsar circuit board. 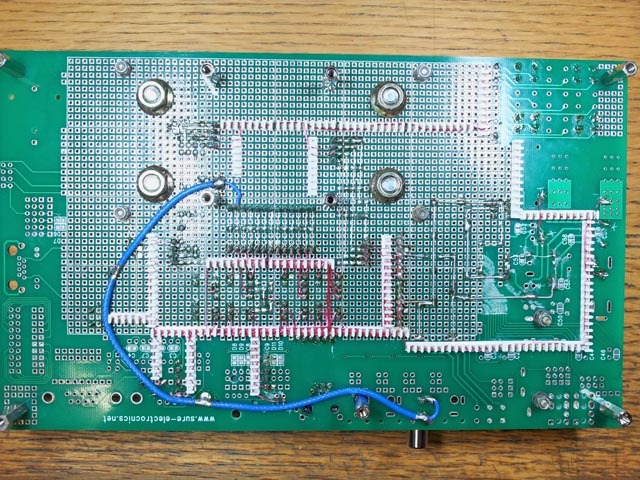 Certain aspects of the new circuit board were fixed, like it's size, position of the LED display and the pads that would connect to external components such as the magnetic reed switches and power lines. The design of the circuit board progressed along side the first prototype board. As the hardware was being tweaked the improvements were reflected back to the circuit board. 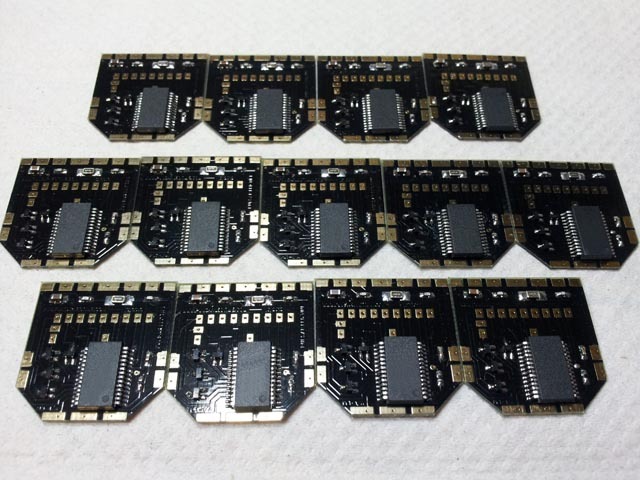 Finally, In October 2012 I ordered the first batch of PCB's to be manufactured. The PCB's arrived and they looked perfect, exactly matching the size of the original board! The first PLT-1 module was then assembled on to the PCB and crudely wired up to a set of switches to replicate the magnetic reed switches of a watch, it was then programmed with the core software and it sprung to life! The new PLT-1 replacement module was a complete success!, We now had a working board driving the original LED display, rescued out of a old broken Pulsar LED watch. 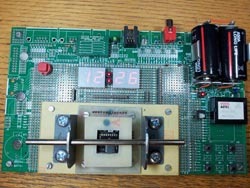 Left hand picture shows the first ever running PLT-1 module. 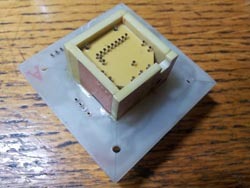 The Replacement LED Module for the Omega, Pulsar and Hamilton LED Watches. 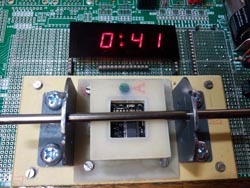 Two boards were then fully assembled and installed in to two Omega TC2 Time Computer watches that we would wear for everyday use and test out. 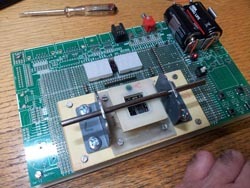 Next step was to construct a proper test jig to take the assembled circuit board for testing and programming. 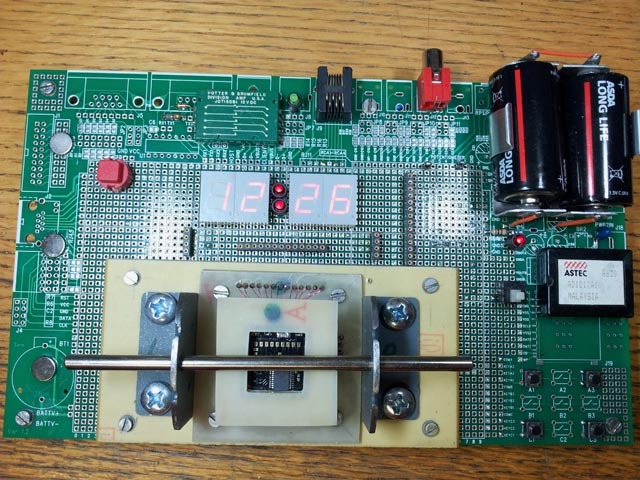 The PLT-1 circuit board was designed from the onset to be quickly and easily programmed, tested and calibrated without actually having a display installed or any soldered wire connections to the completed circuit board. 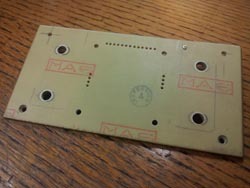 Special test pads were included on the circuit board design to facilitate this. 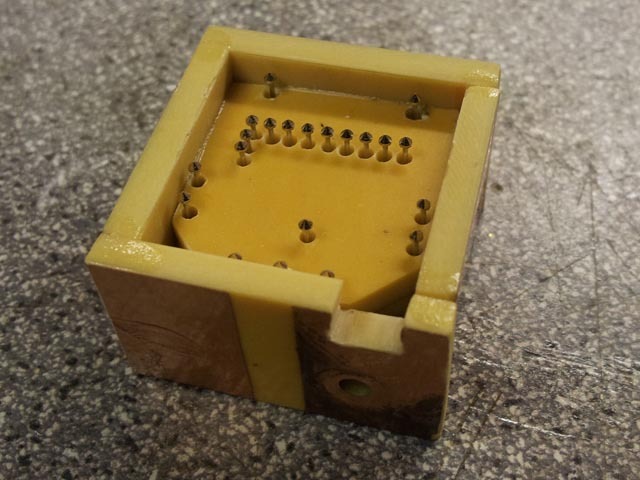 These test pads would connect up to gold plated spring loaded pins when the completed board is placed in to the test pod. 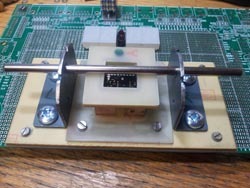 These pins would in turn connect up to an external display and switches on the test jig. 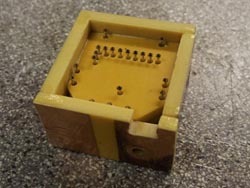 Left hand picture shows a fully assembled PLT-1 LED watch module installed on the original pulsar plastic carrier ready to be installed in to a watch. 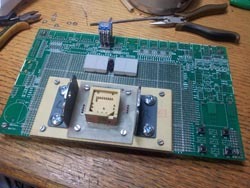 The following photos show the construction of the test pod for PLT-1 circuit board and the test jig. 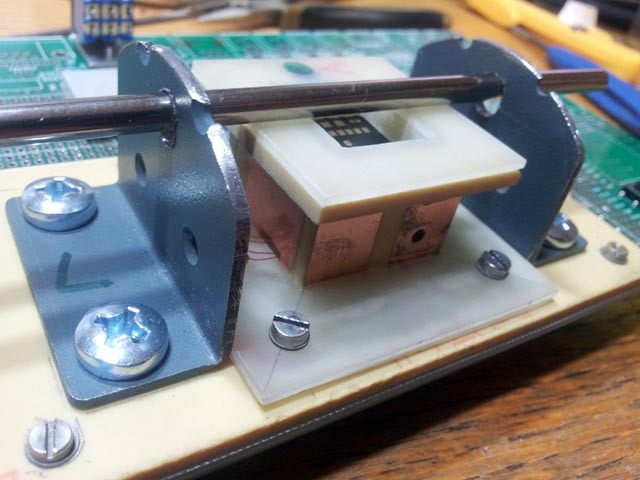 Now with the completed test jig I was easily able to get a completed PLT-1 module with-out the display or reed switches attached, put it down on the test pod then close the pressure plate and program the device. The much larger LED display and switches are mounted externally on the test jig. 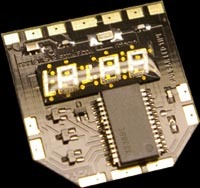 At this stage the core firmware running on the new module was the bare minimum needed to get the module running. It could do the basic functions of a digital watch and had a few minor bugs to iron out, there was still a long way to go. Even though the module now worked like a digital LED watch it did not behave like a Pulsar watch. Now I had to program in the way the original Pulsar LED watch behaved when the buttons where pushed and what displayed on the LED Display. This is not as simple as one may think. There are so many fine points to this, first of all the way the buttons work and interact together. Normally pressing time button would display the time, but that's not the end of it. 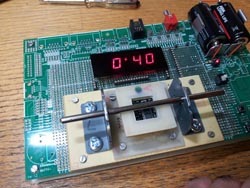 You have to program in various key combinations, for example what happens if one presses the Time and then the Date Buttons together, or what happens if the Time button is pressed first then the Date button, or what if the Set Minute and Set Hour are pressed together and then the Date or Time Button. You get the picture. All these key combinations and behaviour had to be programmed to exactly mimic the original functions of a one or a two button Pulsar watch. Now we had two of the standard operating modes of a single button or a double button Pulsar watch. Next step was to program in the Enhanced modes of operation which would allow the watch to do more than it could originally. Using the enhanced mode a single button watch which could only tell the time would now be able to display not only the time but the date, year and weekday. Over the next few months the configuration menus and extra features like the display test, variable display time out, Display brightness adjustment were added to the firmware of the module and tested. Finally by March 2013, some 5 years after the start of the PLT-1 project, it is finished! I must say that I am very proud with what we have created. We have created something magical. A hybrid. A marriage of almost 40 year old technology and the latest modern technology. With these new PLT-1 replacement LED watch modules, these fantastic old retro Pulsar, Omega and Hamilton watches with the magical dot pattern LED displays should live for another 40 years if not more. I like to think in the years to come, maybe some time in the next century and long after I am gone, some one will be making replacement modules to replace the ones I have been making to keep these watches going for ever. 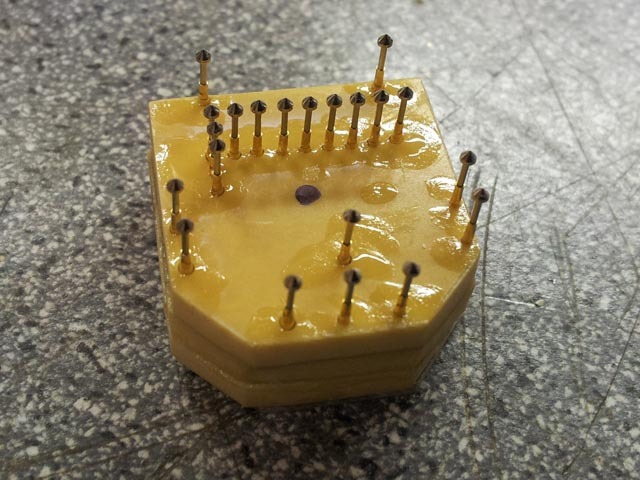 If you would like to support our work and get your un-fixable watch fixed, please visit the PLT-1 Replacement Pulsar LED Watch Module Page for further details. Visitors To This Page Since 11 March 2013.